When I first saw the cover of this book, I knew I had to read it; I didn't even really care what it was about, I just knew that the cover was amazing. When I decided to actually read the synopsis, I got even more excited. So getting the opportunity to review WPM was exciting, and I didn't hesitate diving right in once the book was in my hands. And.... well, it was interesting, that's for sure! The story is told from the perspectives of Wink, Poppy and Midnight. They are each high school kids who have know each other, or at least about each other, for years. Midnight has been in love with Poppy for a long, long time. Poppy has been using Midnight for just as long. Wink isn't close with either of them in the beginning. When Midnight and his dad move into the old farm house next door to Wink's family, he and Wink meet and start to become close. They form an odd, but sweet and strange relationship and slowly Poppy's hold over him loosens. But Poppy always gets what she wants. Always. And she doesn't like that she is losing Midnight to the weird little Wink girl. So begins a game of cruel pranks, sweet friendships, blooming romance, and fairy tales becoming reality. Soon, a cat and mouse type mystery begins, with Poppy at the center, and the truth is almost impossible to figure out, or even understand. Wink, Poppy and Midnight are all very unique brands of characters. Neither one of them are really particularly lovable characters, but they are so interesting and their voices so strong, that they definitely leave a lasting impression. Their voices are incredibly distinct, which makes the multiple POV's perfect. I don't think this particular story would have worked if it had all been in one POV. WPM is a quick as lightning read, with new developments happening every turn of the page. I flew through this book in a day's time, not wanting to put it down for fear I would forget or miss something. This is one weird story. And I do mean weird. Strange is also fitting here. I have never read the Between series by Tulcholke, but if this book is any indication, I know to prepare myself for weird and strange. Which is fine with me, but I can honestly see where this book wouldn't be for a lot of people. Every single character in this book is different, and none reliable in the least. It has an almost fairy-tale type vibe to it, with some magical realism thrown in for good measure. I can't say that I loved WPM, but I liked it. Not really being able to fall in love with any of the characters made it hard to love, but the uniqueness, the strange and weird, were more than enough to reel me in. And when the story ended, I definitely felt like I had been shaken around and spit up. There is no real, satisfying conclusion, which is another reason that I didn't love the book, but I did like that I had to kind of fend for myself in figuring out what had just happened. As far as recommending this book, honestly y'all? I just don't know. I would say yes, read it, just because it is definitely a unique experience and it is so quick of a read, it won't take too much of your time if you don't like it. 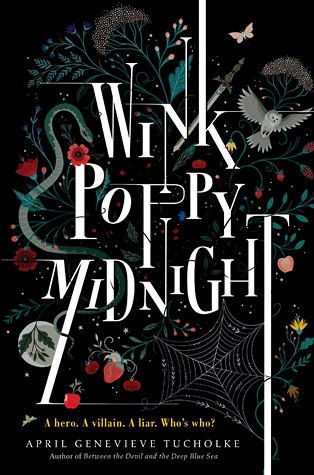 But I just have a feeling Wink, Poppy, Midnight isn't going to be for everyone, and I don't have a clue to whom I should recommend it to. I guess all that I can say is go for it... It is at least worth a read, because Tulcholke is an incredibly special voice, and she deserves to be heard.